Another book that made it onto my 2019 reading list because it kept showing up on various best-of-2018 lists and I decided to see what the fuss was about. And for the first third* the novel “Folly” is pretty great. The story follows the relationship between Alice, a 20-something editor, and much older writer Ezra Blazer in New York during beginning of the American invasion of Iraq (2003 edition). The second third* “Madness” is a seemingly completely disjointed story of Amar, an Iraqi-American who on a layover in London on his way to visit family in Kurdistan, gets the full Kafka treatment at the hands of Heathrow immigration officers. It’s a good albeit frustrating read, but bears only the most subtle connection to “Fully” such that I’m reading wondering if Asymmetry is a novella collection. And then comes the final third, which is a fraction the length of “Folly” and “Madness” (and explains my asterisk after “third”) and finds Ezra in a radio interview discussing the records he would take to a desert island. But, alas, no Alice. I liked this book in spite of not really liking Ezra very much, and I think I’ve figured out how the three stories fit together but I’m not sure and if I happen to be correct I’d rather not spoil it here. 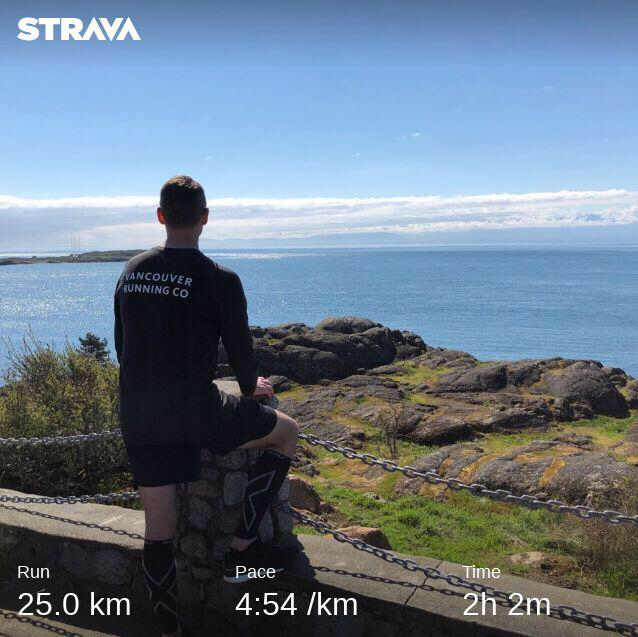 Saturday I ran a 25 KM loop around Victoria for my last long run before the BMO Marathon that is at time of typing just 13 days away. It went okay. But just okay. I had a plan and coach had another and what I did instead was just go for a run by feel after a few kilometres to warm up and not pay attention to pace. So after about 6 KM I “ran faster” for another 8 KM, then a bit of a break before an out-and-back interval along the 1,500 metre Ogden Point Breakwater, then endurance pace home. Like I said, it went just okay. By the end of 25 KM I didn’t have a whole lot left to give, and the idea of running another 17 KM seemed daunting. I think that had sunk in much earlier, though, as I spent the much of the second half of the run coming to terms mentally with the notion that 42.2 KM on May 5 in Vancouver isn’t going to go very well, second guessing my coaching, my training load, my fitness, all of the doubts piled on and by the time I got to the end of it I was fine with it. Like being a bit numb. 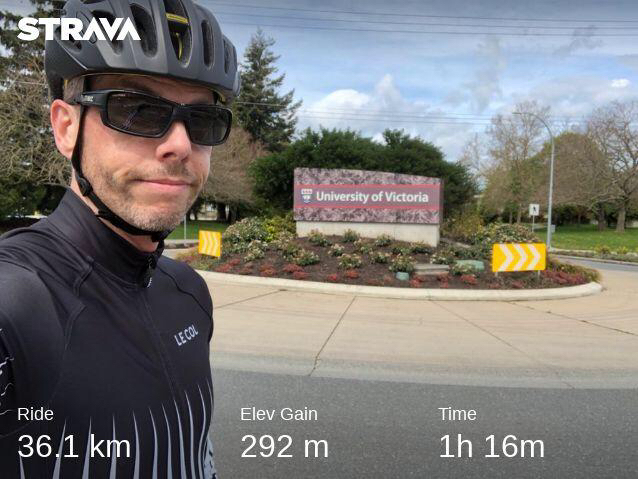 Sunday morning I was scheduled to do a 30 minute recovery run but went for a 36 KM bicycle ride instead and it was really great. I managed to clear my head a bit and put a bit of perspective into the past 10 weeks on my feet, such that when I got home I immediately put my running shoes on and went out for a 5 KM loop with some hills and a bit of an uptempo along the sea side. I’ve set an A and B goal for this marathon, but I’ve been much less rigid with my goals going into this third time out. On Saturday, I felt like running a new personal best was out of reach. Now I’m doubting my doubts. With less than two weeks to go, and having done this twice before, I know it’s pretty much all mental now.